Social media is great for branding and customer service, but don’t overlook its value for lead generation as well. One of the best ways to find and generate leads is through social listening. The great thing about using social media is it gives you the ability to find qualified sales leads, not just random people who might be interested in what you’re offering. Since people openly share information on social media, you’ll get a deeper understanding of what makes them tick. It starts by using social media to identify what your target customer wants and needs. Then use that information to appeal to them and turn them into leads. Don’t worry, we’ll walk you through the entire process and show you how to launch a successful social listening campaign. Many marketers use the phrases social listening and social media monitoring interchangeably. Don’t be fooled – they’re not the same. Social media monitoring is looking at individual conversations going on about your brand or target keywords, usually in real time. For example, you might monitor mentions of your brand name so you can quickly reply to customer service issues. On the other hand, social listening gives you the ability to be more proactive in seeking and making connections. Instead of being on the lookout solely for keywords or brand mentions, you’re gathering information based on the overall sentiment and tone of conversations going on about your brand or industry on social. Whether or not specific campaigns are successful. The overall sentiment about your brand on social. Social listening allows you to find the exact problems and challenges your target audience has, and then create solutions to offer them that are based in the value proposition of your brand. We’re going to walk you through how to use social listening to find qualified sales leads. Plus, you’ll see how to do it without being annoying, pushy or spammy. First and foremost, you need a social media listening tool. Since the bulk of social listening is based on analyzing information, you need a tool that can gather all the data and present it in a way that’s a lot easier on the eyes than spreadsheets. 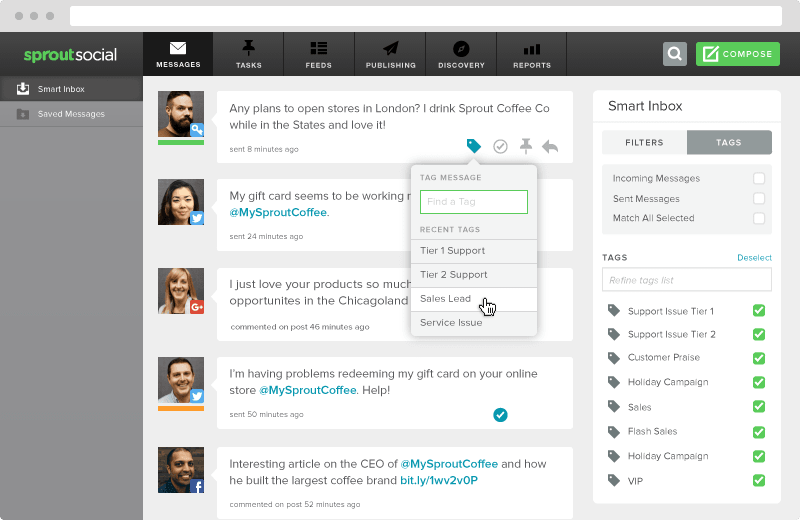 Lucky for you, Sprout Social includes powerful social listening features. 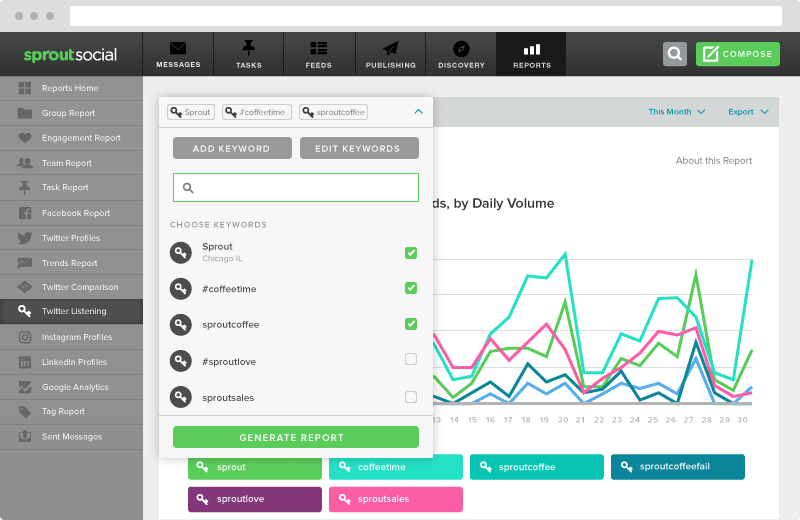 Sprout allows you to save specific search terms and hashtags, and track them over time. Another handy feature is the ability to tag messages. A little later on, we’ll go into more detail on why this is a game changer for using social listening. 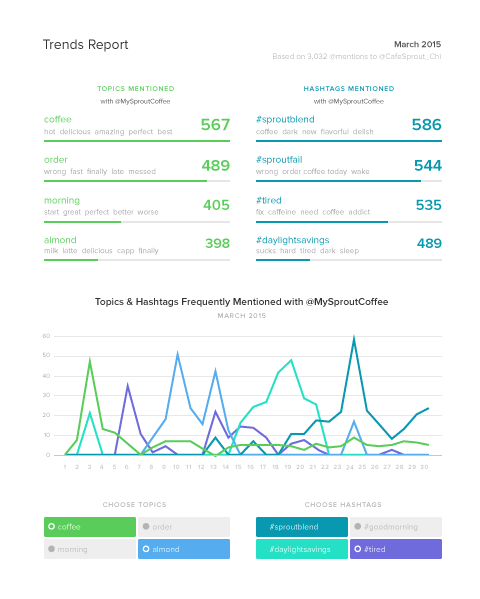 Lastly, you have the option to create reports to see trends in the topics and hashtags you’re tracking. Now that you’ve chosen your tool, the next step is to put systems in place to streamline the process. Since this process will likely involve at least two different teams – sales and social – creating systems is going to make everyone’s life easier. There isn’t a one-size-fits-all solution to systematizing, since every company has different needs and ways of working. We mentioned that message tagging is unbelievably valuable, and here’s why. In any given day, brands receive dozens, hundreds or even thousands of incoming messages on social. Managing all of this can get messy very quickly. Tagging gives you the ability to group similar messages together. That way you can either route certain messages to the right teams or analyze groups of messages. Our social team at Sprout used message tagging and social listening to help identify a need for our LinkedIn analytics feature. They were able to see a trend in the volume of messages coming in requesting LinkedIn analytics, which showed our customers really wanted the feature. Social listening is not a replacement for social media monitoring. You still need to look at individual messages and respond to them when necessary. If someone Tweets your company asking about a service or is directly looking for products you offer, it’s an easy win. Your process should include steps to take when a hot lead comes through social media. For instance, you may assign it to the sales team as a task so they can follow up as soon a possible. The last thing you want is to lose out on sales leads because you’re trying to gather data. Combine social listening and monitoring to strengthen your overall strategy. For a one-person show, this might not be an issue. However, for larger teams, it’s important to understand who’s in charge of responding to which messages. Some messages may require someone from customer service, while others might need a response from the social media or sales teams. 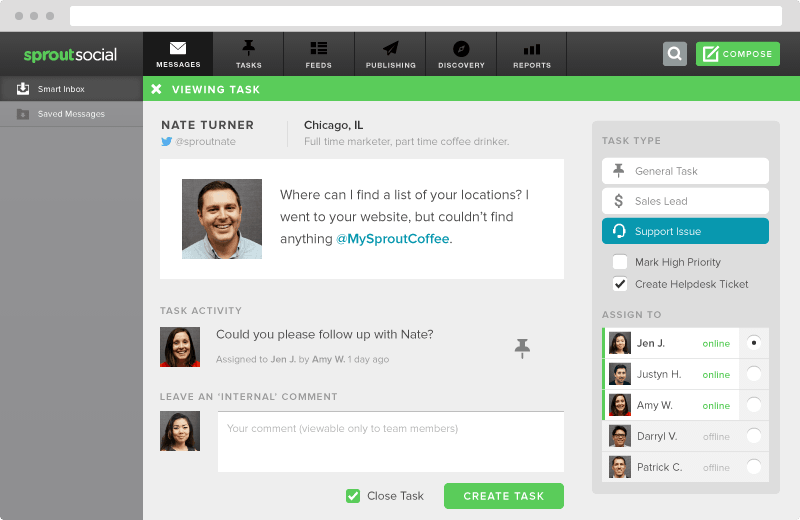 Outlining who’s in charge of which messages will keep things organized, even as your team grows. Now that you have systems in place, the next step is to start looking for conversations. In order to take advantage of social listening, you need to learn how to become an expert at searching. Since social listening is all about finding trends and new opportunities, the phrases you search for are crucial. Using these search terms gives you a better pulse of industry chatter and the specific problems of your target audience. This Tweet is the perfect example of the types of issues a company like Blue Apron can solve. Additionally, certain networks like Twitter have some more advanced search features such as looking for queries involving questions or even positive and negative sentiments. Try to monitor queries with questions because it’s usually the sign of a good lead. People asking questions are looking for solutions to a problem. Providing the solution puts your brand at the top of their mind, even if they’ve never heard of you before. This tactic is particularly helpful on Twitter due to its conversational nature. People are always on the network asking questions when they want a quick response. Your list of search queries will be dynamic. You shouldn’t stick with the same keywords forever. You may even find new ideas based on what you’re currently tracking. Now comes the listening part of social listening. Start by tagging incoming social media messages that include your target keywords. You can organize your tags in whichever way works best for you. You may want tags for customer complaints, a specific keyword, a branded hashtag or sentiment. 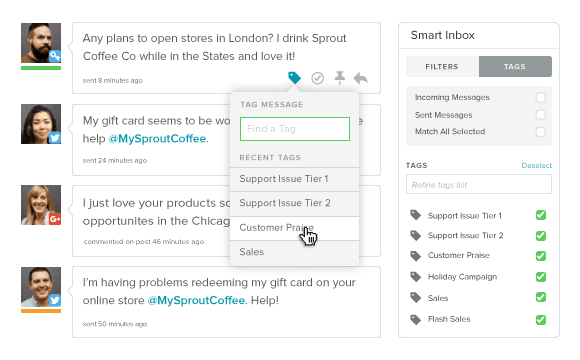 Use Sprout’s tag report to measure the volume of messages coming through with each tag. 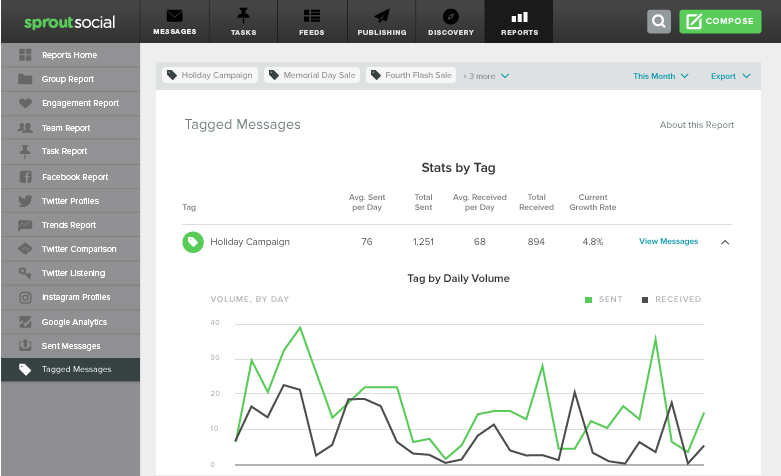 Specifically, look for trends and tags with the highest volume of messages. This information will give you a great starting point when it’s time to create solutions. Alright, so you’ve outlined the phrases you want to search, tagged relevant messages for your social listening campaign and have a good idea of the challenges your target audience is experiencing. The next step is to provide solutions. The solutions can come in the form of new products, blog posts, videos, an FAQ or any other medium that’s appropriate. Since you’ll probably uncover a ton of opportunities through your social listening campaigns, you’ll need to prioritize which ones you’ll attack first. This will be a fairly simple process if you tagged your messages. Start with the tags that have the highest volume. Keeping with the food subscription company example from earlier, let’s say a bulk of your tagged messages were related to healthy ingredients. You could create a healthy shopping guide or printable grocery list of healthy ingredients. Then start promoting it through social media. You could even go through some of the recent Tweets you tagged and start sharing your solution with them. Your freebie will pull people in your site, and hopefully turn them into leads. The benefit of providing a free, valuable resource instead of just directing people to a landing page to buy your product or service is because it’s less spammy. 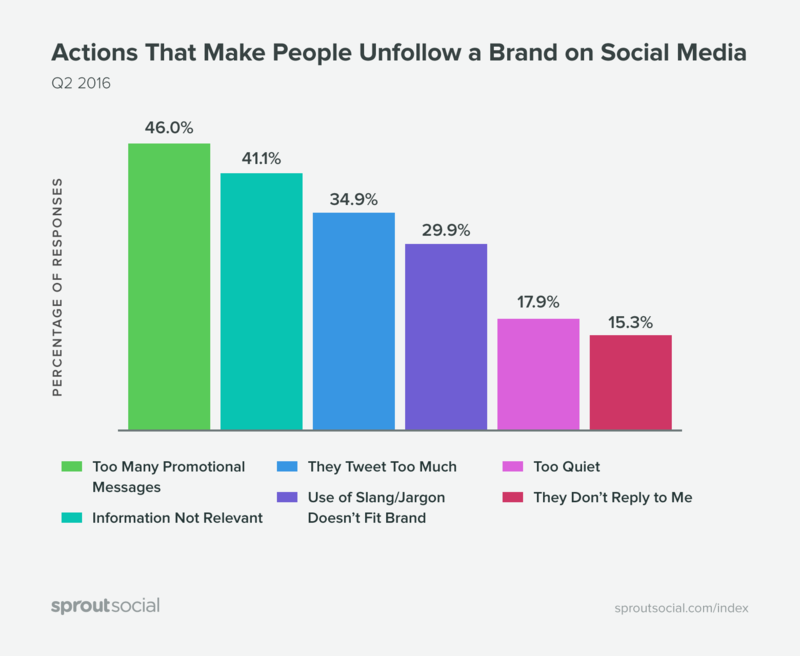 According to our Q3 2016 Sprout Index, 46% of social media users unfollow brands for posting too many promotional messages. On the flipside, when you share helpful and relevant information, people are more likely to keep following you and actually engage. Try not to go too overboard with this approach though. Occasionally sharing links with your audience is nice, but if your entire Twitter feed is filled with replies with a link to the same article, it starts to look a lot like spam. Hopefully it goes without saying, but you also shouldn’t automate this process. While there are some good use-cases for bots in social media marketing, auto-replying to random posts and Tweets with links isn’t one of them. Social listening is an ongoing process. You should constantly look for new opportunities to find sales leads on social media. Whether it’s Twitter, Instagram or Facebook, consumers are using social media more than ever to voice their struggles and look for solutions to their problems. Start incorporating social listening into your strategy to make sure you’re not missing out on any opportunities. Dominique Jackson: Dominique Jackson is a pro blogger, inbound marketing specialist and Twitter addict. You can follow all his Tweets @djthewriter.